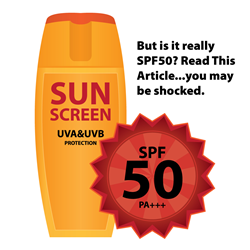 Is Your Sunscreen Really SPF 50? Read This...Be SHOCKED! What was found was very disturbing. Consumer Reports found that only 26% of physical sunscreens actually met their SPF claim after being tested. That is why experienced dermatologists, such as Dr. F. Victor Rueckl and Dr. James Q. Del Rosso of Lakes Dermatology in Las Vegas, have long recommended the use of sunscreen when going outdoors. Yet not all sunscreens are the same, as is evident by a recent study published by Consumer Reports. Licensed medical professionals, such as Dr. James Q. Del Rosso of Lakes Dermatology, have told their patients to protect themselves from UVA and UVB rays by wearing clothing that covers the skin, limiting the time spent outdoors, wearing a wide-brimmed hat, and to use sunscreen when venturing outside. Of course, not all sunscreens are created equal as there are different strengths, which are represented by the SPF (Sun Protection Factor) rating. The American Academy of Dermatology recommends that an individual use a sunscreen of SPF 30 or higher. (2) While one would think that the SPF rating was the sole factor in choosing an appropriate sunscreen, a lot of people have debated the merits of physical versus chemical sunscreens. A physical sunscreen is one that uses ingredients such as zinc and titanium oxide and actually covers one's skin. An example of a physical sunscreen can be seen in movies from the 1980s where a lifeguard was usually depicted with a white coating of sunscreen on their face. By contrast, a chemical sunscreen is absorbed into the upper layers of one's skin. They do not have to physically be on one's skin to block UVA and UVB rays. It is somewhat disconcerting to learn that the Food and Drug Administration does not routinely test sunscreens. This is why the recent study by Consumer Reports has been closely followed by licensed dermatologists, such as Dr. F. Victor Rueckl of Lakes Dermatology in Las Vegas. As one can see, not all sunscreens provide the same level of protection despite what their package says. Many experienced dermatologists, such as Dr. F. Victor Rueckl of Lakes Dermatology, are currently using the Consumer Reports study on sunscreen to educate their patients. The conclusive results of the study show that chemical sunscreens are proven to provide better protection against UVA and UVB rays in comparison to their physical counterparts.